The uplifting musical comedy “Freckleface Strawberry The Musical” will light up Upper Darby Summer Stage. Based on the bestselling book written by actress Julianne Moore, “Freckleface Strawberry” features toe-tapping songs and dances and explores important lessons such as embracing one’s differences. Performances are July 25, 26, and 27 at10:30 a.m. and on July 26 at 7:30 p.m. at the Upper Darby Performing Arts Center. 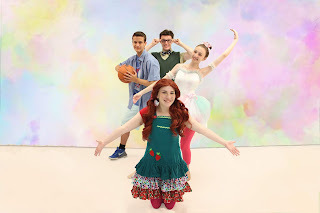 Based on the best selling book by actress Julianne Moore, Freckleface Strawberry is now a fun family musical! Freckleface Strawberry will do anything to get rid of her freckles because she hates being different. With a little help from her friends, Freckleface learns that everyone is different - and that’s what makes everyone special. This might be your favorite show of the summer!